New GW Battleground Poll also examines 2014 campaign tactics. Americans continue to hold strong negative views about the state of the economy and a grim outlook for the next generation’s financial prospects, according to a George Washington University Battleground Poll released Thursday. Voters are uncertain about the direction of the economy: 77 percent of poll respondents are at least somewhat worried about current economic conditions, 31 percent of respondents think the economy is getting worse and another 25 percent say that the economy is poor and staying the same. Just 11 percent say the economy is good and staying the same and 30 percent believe the economy is getting better. The electorate views the economy as the most important issue facing the incoming Congress (29 percent). Among priority issues for lawmakers in 2015, it ranked ahead of illegal immigration (15 percent), health care (12 percent) and foreign threats (9 percent). “Two years into Obama’s second term, the American public is worried and highly pessimistic about the state of the economy and the prospects of improvement for the next generation,” said Christopher Arterton, director of the poll and professor of political management in the Graduate School of Political Management. "When the new Congress convenes in January, voters want the politicians in Washington to address this issue above all else." The poll, which surveyed 1,000 registered likely voters nationwide Dec. 7-11, has a margin of error of +/- 3.1 percent and was conducted in partnership with The Tarrance Group and Lake Research Partners. Half of those surveyed said that the government should engage in fairer and tougher enforcement of government regulations, with 43 percent saying that fewer regulations are needed. The same amount of respondents also said the government is doing too many things that should be left to businesses and individuals. The poll also looked back at the 2014 midterm elections. Of the 77 percent of poll respondents who said they were contacted by a political group, more than half (51 percent) said they were contacted by campaigns too many times, with only 9 percent saying that they didn’t receive enough political outreach. The vast majority said that they were reached by postal mail (98 percent) or a phone call (83 percent), with lower percentages saying they had an interaction via newer communications methods such as email (48 percent) or social media (32 percent). 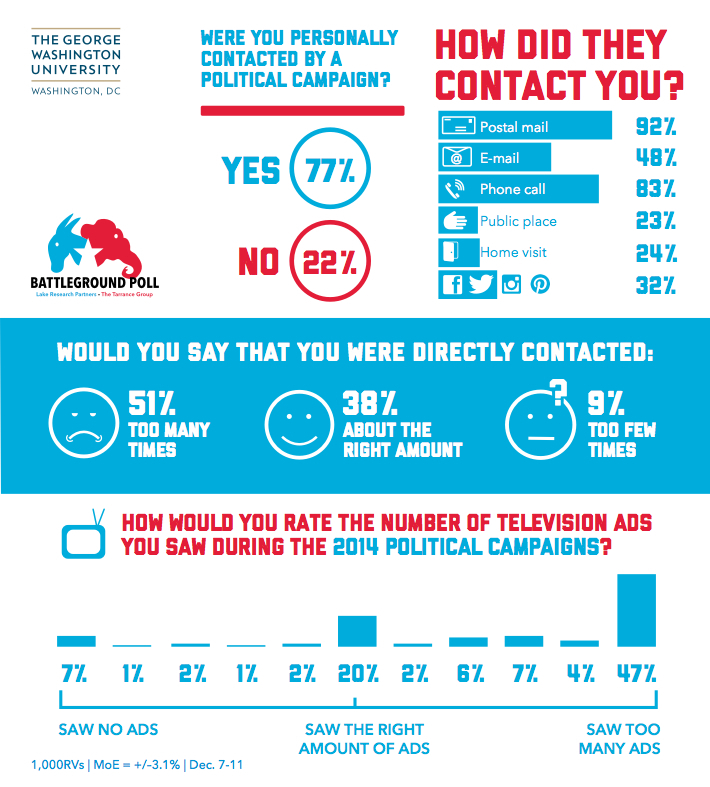 Forty-seven percent of those surveyed said candidates and campaigns pitched them on TV too many times, while just 7 percent reported they saw no advertisements. GW Battleground Poll shows voters remain unhappy with president, Congress. Americans pessimistic about economy; strong public support for changing marijuana laws.